Woodycycles? Yup.. Thanks To Digital Veneer. Limited Edition Riva Tribute Vespa ! So you say, where in the world do you find this stuff Woody? Well.. in this case Auckland! Thanks to fellow Woody Boater Lance Sheppard for finding us really.. This stuff is cool as hell, and from the looks of it, you could have a field day with it.. 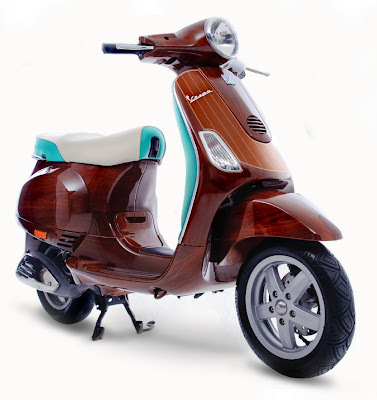 In the example above is as if Riva built there own Vespa.. I LOVE IT! No fake looking fiberglass.. Or if you are a hog sorta dude.. Try it on your Harley tank.. Fear, The Classic Boat Comunities Worst Fear!